clusters - a combination of stars moving together through space. galaxy - a massive system consisting of stars, gas and dust, etc. Seen from space, our planet comes alive with light. 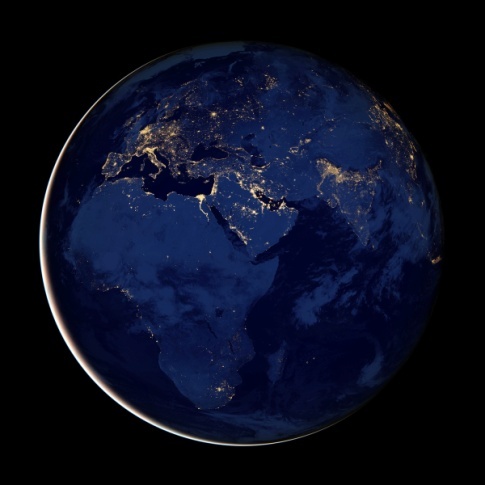 This new view of the Earth’s night lights is a composite of data acquired by the polar orbiting Suomi NPP satellite. Aboard the satellite, a newly designed instrument called VIIRS is able to collect what scientists say is a remarkably detailed view of the Earth at night. In some places, city lights resemble solitary stars in the night sky; in other places, dense clusters of galaxies. As the satellite passes over the darkness of the Himalayas, it shows how human settlement is bound by natural borders. Even political borders are starkly visible in this view of North and South Korea and in a line of fishing boats that dot the Yellow Sea. This new view of the Earth at night offers a unique perspective for exploring the many places in which we live. This new view of the Earth at night offers a unique perspective for exploring the many places in which we live, and seeing the impact of human populations around the world, no matter how faint or how bright their lights shine. Kelly is very beautiful. She resembles the famous actress, Jessica Alba. Traffic slowed down because the heavy rain and the dense fog made it difficult for drivers to see the road. The company is bound by a special agreement to involve the union in important decisions. My father is in a flaming temper because I broke his Rolex watch. The author makes the choice starkly clear that she would not follow the trend but stay true to her own creativity and ideas. He also argued that, from a technical perspective, the fixed interest market was sending out a strong buy signal for equities. There's just a faint chance that the weather will improve by tomorrow, I guess we will eventually need to reschedule the picnic. Peter is a solitary child who enjoys being alone and playing on his own.